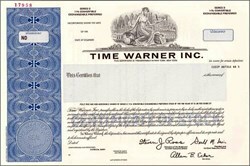 Home > Entertainment, Hotels, Motion Pictures and Sports > Motion Pictures and Other Entertainment > Time Warner Inc.
Home > Rare and Unique, Specimens > Specimen Stocks, Bonds and Documents > Time Warner Inc. Beautifully engraved Specimen from the Time Warner Inc. . This historic document was printed by the Security-Columbian United States Banknote Company and has an ornate border around it with a vignette of an allegorical woman infront of a city skyline. This item has the printed signatures of the company's officers including Steven Ross as Chairman of the Board.